This summer, we’re launching the biggest update WhosOn has ever seen. WhosOn 2018 is our magnum opus. It’s built on a fifteen-year foundation of live chat predecessors, standing on the shoulders of the award-winning products we’ve been pushing out since 2002. WhosOn 2018 has been recoded from the ground up to give you super-fast performance, a sweeping range of added features, and a sleek, modernised design. What is not being updated? The click to call back feature is being replaced by our superior missed chat rescue offering. This will be included in our next iteration of WhosOn 2018, to be available imminently. Remote control is being discontinued due to low demand and easier third-party options. An updated ticketing system is included in our product roadmap, planned in the next year. Don’t worry if you need urgent access to these features – they are not lost to you. Instead, we are also offering an updated edition of our classic client. This edition will have the legacy feature set and design, but will be able to run on our updated 2018 servers. While we would urge all customers to make the switch to the new and improved WhosOn 2018, this classic edition remains a backup option for those who prefer our legacy features. Which customers does the update affect? All WhosOn customers can enjoy the latest 2018 release. However, the update has a slightly different impact based on your licence type and preferences. For cloud customers, upgrading is a necessity. (Whether you choose the recommended new WhosOn 2018 edition, or the updated version of our classic edition.) This is because we will be updating all WhosOn servers on which the chat service is hosted, and legacy clients will be restricted on these updated servers. If you continue using a legacy client after the WhosOn 2018 release, some of your features will be unavailable. For on-premises customers, the update is optional. While we strongly advise that you make the upgrade to WhosOn 2018 and benefit from its better features and performance, you’re in control of your own server maintenance. If you choose not to upgrade, your service will remain exactly as it is at present. However, you will not be able to experience the vast range of improvements we’ve brought to the table. As you might have guessed based on what you’ve just read, there are two upgrade paths: one for cloud customers, and one for on-premises customers. Since cloud customers have a hosted chat experience, they need only download the new chat client – we take care of the server updates. For on-premises customers, there are a few more steps required to upgrade to WhosOn 2018, including downloading a new server kit. To help, we’ve outlined each journey below. You can download the new chat client before the general release of WhosOn 2018. This gives you time to get familiarised with the product’s new look and feel, without losing access to your settings while we get each server updated. 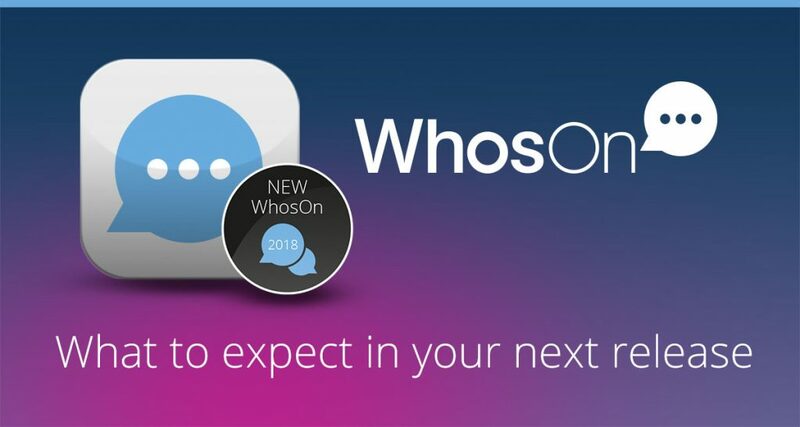 We’re sending out an email with your direct link to the WhosOn 2018 chat client. Simply follow the instructions provided and make your download to kickstart the upgrade process. For a short settling in period, you’ll be able to use both the old chat client and the new WhosOn 2018 edition on the same computer, at the same time. While you start exploring the new-look WhosOn, please bear in mind that its full feature-set will not be available until the server is upgraded. Key elements such as your new dedicated settings portal will not be ready until the server update. So, we don’t advise retiring the old client until the general WhosOn 2018 release is ready. We are releasing WhosOn 2018 on a server by server basis. You’ll be notified by email once your server has been updated. As soon as you get this email, you can make the complete switch to WhosOn 2018, enjoying its full range of features and gaining access to your new settings portal. From this point on, the old client can be retired. While your chat service will not be disrupted if you do not upgrade, legacy editions of WhosOn will not be fully featured on the new server. For customers who self-host WhosOn on their own servers, you must be subscribed to receive support and updates to download the latest edition. You can check the status of your support contract here: https://www.whoson.com/update/. If you have a support contract in place, you’ll be able to upgrade as soon as WhosOn 2018 is released. If you don’t, you can request one via the same link and our customer service team will get you supported. The next step is to update your server kit to the WhosOn 2018 version. While our new chat client will still run with a legacy server kit installed, you will not be able to access its full range of features. So, be sure to update your server to experience the full WhosOn 2018 offering. Once your server has been updated, you should download the WhosOn 2018 chat client. With both the new chat client and the new server kit installed, you’ll be able to enjoy the full range of added features and gain access to your new settings portal. WhosOn 2018 will be rolled out on a server by server basis. So, we will be contacting each customer when their server is ready. You can expect this process to be complete by the end of July. For on-premises customers hosting WhosOn on their own servers, the release will be available in August. Keep an eye out for the official release email in your inbox. Standard support is available for all cloud customers as part of your licensing model. This includes expert support via email, telephone and live chat, courtesy of our in-house technical team. For on-premises customers, you must be subscribed to receive support and updates to gain access to those services. Your support contract entitles you to help from the WhosOn team via email, telephone and chat. However, we understand that for some customers – such as those with dedicated servers, complex installations or paid-for custom features – the switchover to WhosOn 2018 might be slightly less straightforward. In these instances, you may need more than a quick live chat session or phone call. So, we’ll be here to help. For dedicated server customers, our team will help support your transition to the latest edition. We’ll be in touch to ensure that there is no disruption to your service during the upgrade journey. For on-premises customers with server switchovers to handle, we will also be offering a complete managed upgrade service. We can test the upgrade within your environment, ensure that WhosOn 2018 functions as expected, and ensure that everything has been preserved and upgraded successfully. If you would like to find out more about this managed upgrade service, drop us an email via sales@parkersoftware.com. What is the next step for WhosOn? After the release of WhosOn 2018, we will be busy finetuning the product, incorporating customer feedback, and adding the features still under development. Particularly exciting touchpoints in our roadmap include out of the box chatbot options and a push towards omnichannel integrations. We can’t wait to introduce you to a slicker and smarter chat experience. If you have any questions about the WhosOn 2018 upgrade in the meantime, please feel free to drop us a message.